After being fairly impressed by SNSD‘s Hyoyeon‘s first solo track “Mystery”, I was looking forward to “Wannabe” featuring San E. The teaser seemed to promise a very interesting beat as the groundwork and the visuals solidified what I had suspected: Hyoyeon giving off the image of edgy by using rap as a conduit. The full MV does all that, and it got some things right and some things wrong. The visuals from the teaser had me rolling my eyes and the full MV? Even more so. 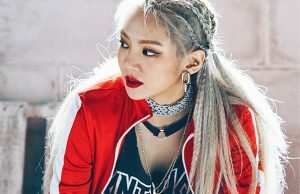 The video is shot in a gym where Black men are working out and paying no mind to Hyoyeon rapping, singing, and doing lackluster choreography with other Korean backup dancers. The guys in Hyoyeon’s video serve no other purpose but to just exist and make it seem like Hyoyeon has street credit and “swag”. She doesn’t even interact with any of them, so they are devalued to the status of ornaments. It would have been preferable to cast Korean men working out at the gym instead. Lyrically, the song is all over the place as Hyoyeon seems to switch from one topic to another. In the first verse, she raps about being a “#it girl”, then in the chorus, she sings about lying and not being answerable. San E’s verse was a nice addition but makes little sense lyrically, much like the rest of the song, as a result feels disjointed. His verse is somewhat memorable, thanks to that throwaway line about “being a feminist”. The song itself has an interesting foundation for its sound, a reversal of the transition from a heavy beat to an exciting rhythm that makes this a decent background for the verses. However, it did not reach its potential with Hyoyeon’s rapping. From her intonation to her flow, her rap verses expose a complete lack of ability. It comes off as a bit nasally, the chorus sounds outdated, and there seemed to be too many syllables crammed into the song. The saving grace of this song is the arrangement of the chorus, because Hyoyeon’s singing is a much better fit during that part. The use of drums and guitar at the end complements the tones of her voice by creating a tempo that her singing can keep up with, unlike the rap verses where it sounded like she was struggling to match the pace of the beat. Purposefully disjointed songs can be done, but “Wannabe” has not achieved this in a significant way. The rapping part switching to a pop-ish chorus was confusing at first, but did grow on me after the second play. If the song had more of Hyoyeon singing like she did in the chorus, and more of San E’s rapping, the track could have been more cohesive. Ultimately, the MV could have done without the try-hard swag and using Black background actors to further establish a “bad girl” image for the song, which is an overdone trope across the globe. It’s not clear who Hyoyeon wants to be, or is trying to be, but this solo comes off as a step in the wrong direction.